Clifton Walker, Jr. hails from a proud, but tragic, Chicago family. The son of a former mayor, his father served in office for only two days before falling victim to a fatal mafia hit. Crestfallen, Clifton headed deep undercover to try to find his father's killer. Learning the art of pugilism from a mafia-run underground fighting ring, he claimed the name "The Lion Son" to strike fear into the hearts of his enemies. His wish - to get justice! As you can see, ol' Clifton has a sort of old timey boxing Batman thing going on for him, as he slugs his way to the top of "His Majesty's Fisticuffs Bouts." He doesn't wear a mask though, because when you have a mustache like he does, masks just get in the way! 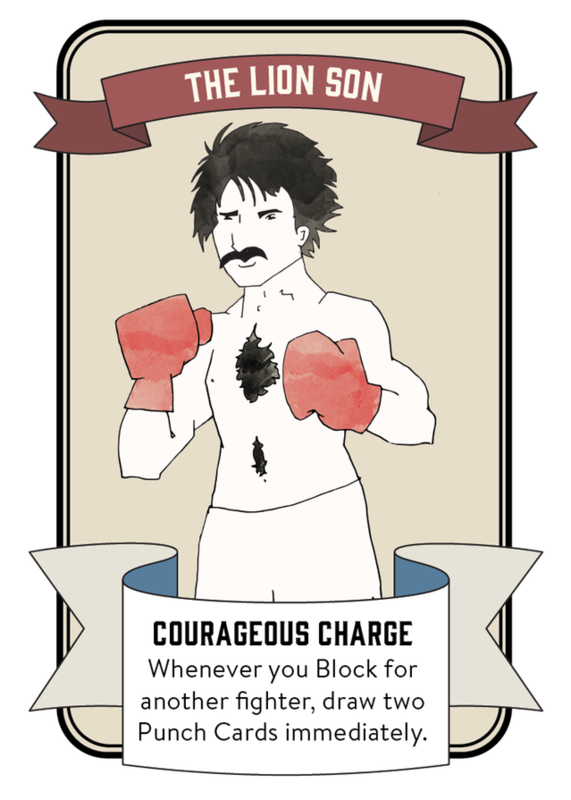 In playtesting, The Lion Son easily became a fan favorite because of his supremely powerful special move: the Courageous Charge. With it, whenever Clifton would block for another fighter, he gets to draw two Punch Cards immediately. This incredible ability meant that Clifton would be able to build up blocks and counters for every situation through massive card advantage, as well as making a lot of friends around the table because he would block for others. A common question during playtests would be, "Hey Clifton, could you block that for me?" The Lion Son lends himself well to players who want to get into fights early and often, and it supports a really aggressive play style since it generates so many cards to play with. However, Clifton has his share of drawbacks. The obvious one is that whenever Clifton blocks for someone, he exposes himself by getting involved in that combat - a deadly deal that could result in him getting clobbered! Additionally, the build up of card advantage with a lack of clever politicking with others at the table, could paint a huge target on The Lion Son. Clifton doesn't draw two cards when he has to block for himself! Lastly, The Red Raider has a nice built in counter to The Lion Son's ability - she can exchange her hand with another fighter at the start of her turn, making The Lion Son's card advantage her card advantage, but we'll talk about that more in another update. Our tip: While playing as The Lion Son will make you want to get involved quickly and often, exercise patience with your blocks. Even though you'll get a lot of benefit for blocking, use your block as a political action - when someone is in trouble, block for them in exchange for an alliance or short term team up - then block for that fighter often. You'll get the cards, but more importantly, you'll take a little bit of heat off of you when you start building up cards blocking for that person since they'll stick up for you. Clifton is the son of a mayor - so politics are important!